Mike is a 16 times National Record holder for team Great Britain, an SSI Freediving Instructor Trainer, and a former Royal Marine Commando. His commitment to Freediving as a passion and a sport is apparent in every course he teaches and student he inspires. Mike has a strong background in teaching. As a Freediver, he is an SSI Instructor Trainer and an Apnea Total Master Instructor, but he is also a TDI Technical Diving Instructor and a PADI OW Scuba Instructor. He has a strong physical approach to his own training, however through Freediving he has discovered that equally important is the balance achieved through activities such as yoga and gaining greater self awareness and mental focus. Both approaches feature strongly in his teaching style. As an instructor he believes that you should be able to do what you teach and so regularly strives to discover his own limits and extend them, through competing in Freediving and the training that goes with it. Mike has dived to 111m in the Constant Weight with Fins (CWF) discipline, has set sixteen British National records, and is the current British record holder for CWT at 108m and for Free Immersion (FIM) at 100m. He was also a member of the British Freediving Team (www.britishfreediving.org) for the 2011, 2013 and 2015 Individual World Freediving Depth Championships and Team Captain for the British Freediving Team at the 2014 Team World Freediving Depth Championships. Through competing in international competitions and exploring progressive training techniques, Mike ensures that all the teaching at Freedive Gili evolves along with the sport of Freediving. As part of the Freedive Gili team Mike teaches Instructor courses throughout the year (when not away competing!) 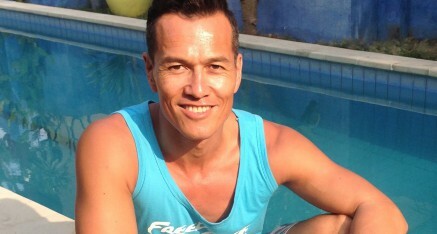 and is keen to share his passion for Freediving with you. Mike first visited Gili Trawangan in 2001 whilst traveling as a scuba instructor and instantly fell in love with its crystal clear waters, great diving and the relaxed beach lifestyle. In 2008 Mike returned to Gili Trawangan with the vision of Freedive Gili and opened the first Freediving and Yoga center in the region in 2009. Kate is a passionate Yoga Teacher Trainer, Level 3 SSI Instructor and competitive Freediver, inspired by deeper experiences of life in the elements. She is dedicated to embodied living and shares her personal practice and exploration through Yoga, Meditation and Freediving. With the intention of creating an environment that supports learning, adventure, conscious community and her greatest passions Kate co-created Freedive Gili, Gili Yoga and The Yoga Garden on Gili Trawangan in 2009. Over the past 3 years of Freediving competitively, Kate has set 18 National Records for New Zealand and won a Silver medal at the most recent World Championships. She holds the NZ National Records in Constant Weight at 97 meters and Free Immersion at 84 meters. Kate is motivated to train and compete by everything she learns along the way. It is the process of conscious evolution that inspires her to learn, love and teach from the heart. Kate leads month long Vinyasa Flow and Meditation Yoga Teacher Trainings each year at Gili Yoga. SSI Instructor Trainer, AIDA Instructor and accomplished competitive Freediver in all disciplines (pool and depth) diving to 100 meters in Constant Weight, Viktor brings years of training and teaching experience to the Freedive Gili team. Viktor has represented the Ukraine in the team World Championships. You can join him for his upcoming Freediving Instructor Training Course! Chris has always been a water person. Starting as a surfer and falling in love with the sea, he soon became a scuba instructor. After many years instructing, he decided to branch out a little further and became a freediving instructor. He is now dedicated to showing the wonders of the underwater world on 1 single breath. Veronika grew up in Germany as far away from the sea as you can imagine. She started freediving when she moved to England and fell in love with it. Soon after she decided to turn her new found passion into a profession. She came to Freedive Gili to take her instructor course and then stayed to share her love for the sport and the sea. Severi calls himself a “local product”, having gone through our Zero to Hero here program. He loves to share his knowledge and thoughts on our sport and he loves helping people to realize their underwater potential.